You want to print the contents of an array. Use PHP’s print_r() or var_dump() functions. The print_r() and var_dump() functions are great ways to X-ray the contents of an array variable, and print a hierarchical listing of its internals. The above demonstrates them both in action. Note that var_dump() produces more verbose output (including information on data types and lengths) than print_r(). You want to iteratively process the elements in an array. // result: "John | Joe | Harry | Sally | Mona | "
// result: "UK: London US: Washington FR: Paris BD: Dhaka "
PHP’s foreach() loop is the simplest way to iterate over an array. At each iteration, the current array element is assigned to a temporary variable, which can then be used for further processing. For associative arrays, two temporary variables may be used, one each for the key and value. You want to process all the elements in a series of nested arrays. // result: "UNITED STATES TEXAS PHILADELPHIA CALIFORNIA LOS ANGELES SAN FRANCISCO"
It’s fairly easy to iterate over a single array, processing each and every element in turn. Dealing with a series of nested arrays requires a little more effort. The previous listing illustrates the standard technique, a recursive function that calls itself to travel ever deeper into a layered array. The inner workings of the arrayTraverse() function are fairly simple. Every time the function encounters an array value, it checks to see if that value is an array or a scalar. If it’s an array, the function calls itself and repeats the process until it reaches a scalar value. If it’s a scalar, the value is processed—the previous listing calls strtoupper(), but you can obviously replace this with your own custom routine—and then the entire performance is repeated for the next value. You could also use an Iterator from the SPL. Iterators are ready-made, extensible constructs designed specifically to loop over item collection—directories, files, class methods, and array elements. A predefined RecursiveArrayIterator already exists and it’s not difficult to use this for recursive array processing. To recursively process an array, initialize a RecursiveIteratorIterator object (this is an Iterator designed solely for the purpose of iterating over other recursive Iterators) and pass it a newly minted RecursiveArrayIterator. You can now process all the elements of the nested array(s) with a foreach() loop. You can read more about the RecursiveArrayIterator, the RecursiveIteratorIterator, and the RecursiveIterator interfaces at http://www.php.net/~helly/php/ext/spl/. You want to find out how many elements an array contains. The count() function returns the number of elements in the array. An alternative is to use the sizeof() function, which does the same thing. You want to decompose a string into individual elements and store them in an array, or combine the elements of an array into a single string. // result: "John and Joe and Harry and Sally and Mona"
clearly illustrates this: the explode() function scans the string for the delimiter and cuts out the pieces around it, placing them in an array. Once the list items have been extracted, a foreach() loop is a good way to process the resulting array. PHP’s implode() function does the reverse. It iterates over an array, joining the elements into a single string. An optional delimiter, typically a comma (,) or colon (:), can be used to separate the array elements from each other in the final string. The previous listing illustrates this by using the word “and” to join the various array elements into a readable sentence. You want to interchange the keys and values of an associative array. You want to add or remove elements from an array. // add 2 elements between "black" and "white"
but operate on the end of an array instead. Note that the array is automatically re-indexed after each operation. Note: You can add multiple elements with array_unshift() and array_push()—simply specify them as additional arguments in the function call. Comment: It is not usually appropriate to use the array_unshift() and array_push()functions with associative arrays. Elements added in this manner will have numeric, rather than string, indices. To add or remove elements from the middle of an array, use the array_splice() function. This function packs a lot of power under an unassuming exterior—it can be used to “splice in” new array elements, optionally replacing existing elements in the process. handy for removing elements from the middle of an array. Note that the array is automatically re-indexed after array_splice() has finished. You can actually use array_splice() to perform all the functions of array_pop(),array_push(), array_shift(), and array_unshift(). The PHP manual page at http://www.php.net/array-splice has more information. The array_unshift(), array_shift(), array_pop(), and array_push() functions only work with previously initialized arrays. You’ll get an error if you attempt to use them on uninitialized array variables. You want to retrieve two or more successive elements from an array. PHP enables you to extract a subsection of an array with the array_slice()function, in much the same way that the substr() function enables you to extract a section of a string. The function takes three arguments: the array variable to operate on, the index to begin slicing at, and the number of elements to return from the start position. It’s important to note that array_slice() is less intrusive than the array_splice() function discussed in the listing in “4.7: Adding and Removing Array Elements”—array_splice() alters the original array, while array_slice() merely returns a subset, leaving the original array unchanged. You want to strip an array of all duplicate elements to obtain a unique set. // result: "10, 20, 40, 35, 80, 50, 55, 30, 70, 85, 90"
You want to re-index a numerically indexed array after removing elements from it, to close up the “gaps” in the indexing sequence. If you remove one or more elements from the middle of an integer-indexed array with the unset() function, PHP doesn’t automatically re-index the array for you. As a result, you end up with an array containing nonsequential index numbers. It’s generally a good idea to close up these “holes” in the array indexing sequence, to eliminate the possibility of them skewing your array calculations. The simplest way to do this is to retrieve the list of array values with the array_values()function, and then reassign this list back to the original array variable. This reindexes the array and closes up the gaps. Because associative arrays use string indices, you don’t need to re-index them in this manner after unset()-ting their elements. You want to shuffle an array randomly, or retrieve one or more random elements from an array. numerically indexed arrays. If you’d prefer to leave the array order untouched and just pull out some elements at random instead, the array_rand() function is a better bet. This function returns an array of randomly extracted keys, which you can then use to retrieve the corresponding array values. You want to reverse the order of elements in an array. PHP’s array_reverse() function is pretty simple—give it an array and it returns a new array containing the elements of the original array, but in reverse order. Keyvalue association is retained for associative arrays, but numerically indexed arrays are re-indexed. You want to search an array for a particular key or value. 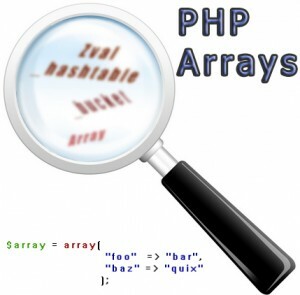 PHP comes with two functions that let you search both array keys and values: the array_key_exists() function scans an array’s keys for matches to your search term, while the in_array() function checks its values. It should be noted, though, that the search capability here is fairly primitive; both functions will return false unless they find an exact match for your search term. Here, the preg_match() function is used to search both keys and values of an array for a match. You can, of course, modify this to suit your own requirements. You want to search a series of nested arrays for a particular key or value. // search for string "in"
custom arraySearchRecursive() function traverses the nested array, checking each key and value for matches to the search string with the preg_match()function. Matches, if any, are placed in a separate $matches array. At each stage of recursion, the “path” to the element—the sequence of array keys leading to the element—is tracked; this path is also stored in the $matches array as an aid to identifying the matching elements post search. Iterators) and pass it a newly minted RecursiveArrayIterator. You can now search all the elements of the nested array(s) with a foreach() loop and a call to preg_match(). You can read more about the RecursiveArrayIterator, the RecursiveIteratorIterat or, and the RecursiveIterator interfaces at http://www.php.net/~helly/php/ext/spl/. You want to eliminate those elements of an array that don’t match certain criteria. through a user-defined function and checking the return value. Those array members associated with a true return are flagged as “special,” and placed in a separate array. This is clearly illustrated in the previous listing. Here, the user-defined isPositive() function returns true if its input argument is greater than 0. The array_filter() function runs isPositive() on every member of the $series array, and checks to see which members generate a true value. The true return serves as a flag to filter out positive values, which are then placed in a separate $positives array. You want to sort an array by key or value. Numerically indexed arrays in alphanumeric order. This function is not suitable for associative arrays, as it destroys the key-value association of those arrays. If you need to sort an associative array, consider using the asort() or ksort() functions,which sort these arrays by value and key respectively while simultaneously maintaining the key-value relationship. The previous listing illustrates all three of these functions. You can reverse the sort order of the sort(), asort(), and ksort() functions by replacing them with calls to rsort(), arsort(), and krsort() respectively. You want to sort a multidimensional array using multiple keys. If you’re familiar with Structured Query Language (SQL), you already know how the ORDER BY clause enables you to sort a resultset by more than one field. That’s essentially what the array_multisort() function was designed to do: it accepts a series of input arrays and uses them as sort criteria. Sorting begins with the first array; values in that array that evaluate as equal are sorted by the next array, and so on. This function comes in handy when dealing with symmetrical multidimensional arrays, like the one in the previous listing. Such an array is typically created from an SQL resultset. To sort such an array, first break it into individual single arrays, one for each unique key, and then use array_multisort() to sort the arrays in the priority you desire. In such a situation, the last argument to array_multisort()must be the original multidimensional array. You want to sort an array using a custom sorting algorithm. This then serves as the basis for re-sorting the array. You want to sort a series of nested arrays. This listing builds on the technique discussed in the listing in “4.3: Processing Nested Arrays” to recursively traverse a series of nested arrays. The sortRecursive()function accepts three arguments: an array, the name of an array sorting function (either built-in or user-defined), and optional arguments to said function. It then traverses the array and all the arrays internal to it, sorting each by the specified function. Note that the array input to sortRecursive() is passed by reference, so any changes take place to the array variable itself and not a copy. You want to merge two or more arrays into a single array. straightforward when dealing with numerically indexed arrays, but can trip you up when you’re working with associative arrays: If you try merging associative arrays that have some key names in common, only the last such key-value pair will appear in the merged array. recursively merged into a single sub-array and no data is lost during the merge process. You see this in the output of the second listing in the previous code. You want to compare two arrays to find the common or different elements. having to deal with one of two tasks: finding the elements common to both arrays (C), or finding the elements that exist in either one of the two arrays, but not both simultaneously (A+B). the two arrays, but not both simultaneously, is a little more complex, and requires knowledge of the array_diff() function. Given two arrays, this array_diff() function returns all the elements from the second array that do not exist in the first. This means that you can obtain the required (A+B) set by running array_diff() twice, swapping the order of comparison each time, and then merging the resulting arrays. You should also run the array_unique() function on the merged array to eliminate any duplicates. This process is illustrated in the second listing. I teach much of you. If i learn all your lesson what you think can i get zend certificate 🙂 ?